With the lackluster performance of the WTO negotiations in the past years, monopoly capital has renewed its focus on bilateral and regional free trade agreements (FTAs). This reorientation aims to push contentious issues that would otherwise not be possible to advance within the context of a multilateral trade regime such as the WTO. This strategy is increasingly being felt across Asia Pacific with the recently concluded Trans-Pacific Partnership (TPP), and now the Regional Comprehensive Economic Partnership (RCEP) which is recently gaining steam. Both agreements if passed and ratified will threaten the basic rights and freedoms of peoples in the region. These two trade agreements also represent the heightening rivalry between the US-led TPP and the Beijing-led RCEP over who sets the standards of trade in the region. However, it must be made clear that in this tug of war, the real concern for the people is not about which side should win. Neither the TPP nor the RCEP, neither the US nor China and their corporations will ever address the long-standing people’s aspiration for an international trading system that responds to their needs. 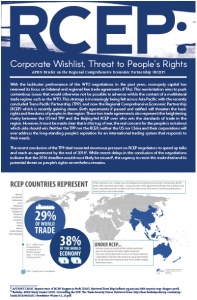 The recent conclusion of the TPP deal mounted enormous pressure on RCEP negotiators to speed up talks and reach an agreement by the end of 2016. While recent delays in the conclusion of the negotiations indicate that the 2016 deadline would most likely be missed, the urgency to resist this trade deal and its potential threat on people’s rights nevertheless remains.